We’ve been home a little over a day now, but my brain is still reeling from this incredible experience. We may have been bitten by bugs or burned by the sun, but this trip is one I’ll always remember. 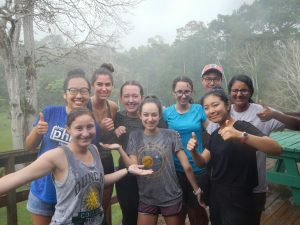 I relished the opportunity to learn about field work and to do science experiments in new environments with people who are just as passionate as I am (if not even more!). I had never really visited a rainforest in its pristine quality such as the Chiquibul area around Las Cuevas. 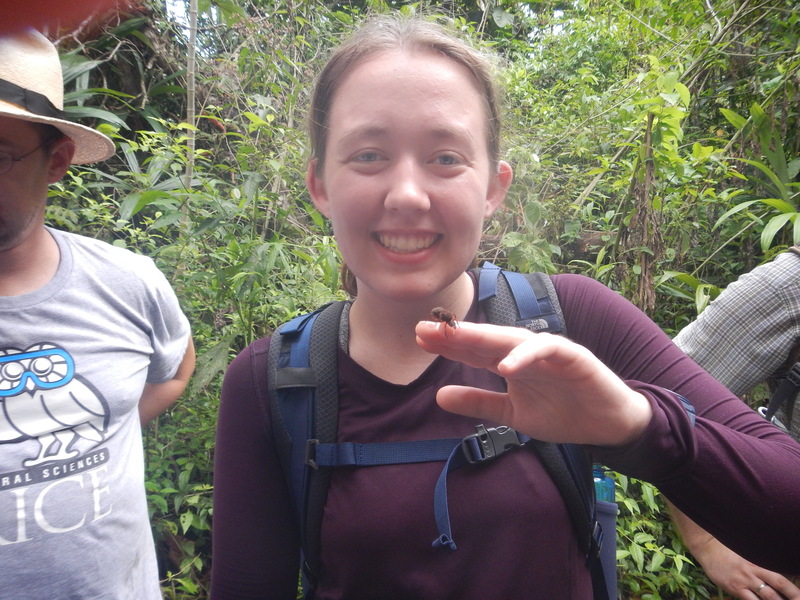 There were just so many hymenopterans, insects, and plant diversity. My expectations were high due to the Planet Earth’s wonderful episodes, but wow, I was still floored. Similarities wise, when comparing the rainforest to a reef, there is an equal amount of diversity—there are plants and coral that are common or rare (for their respective ecosystems), and the same seems to apply to animals/fish in both places! It’s just wild to me how such brilliant ecosystems can support as much life as they do. I was also shocked at just how much rain affected the rainforest. 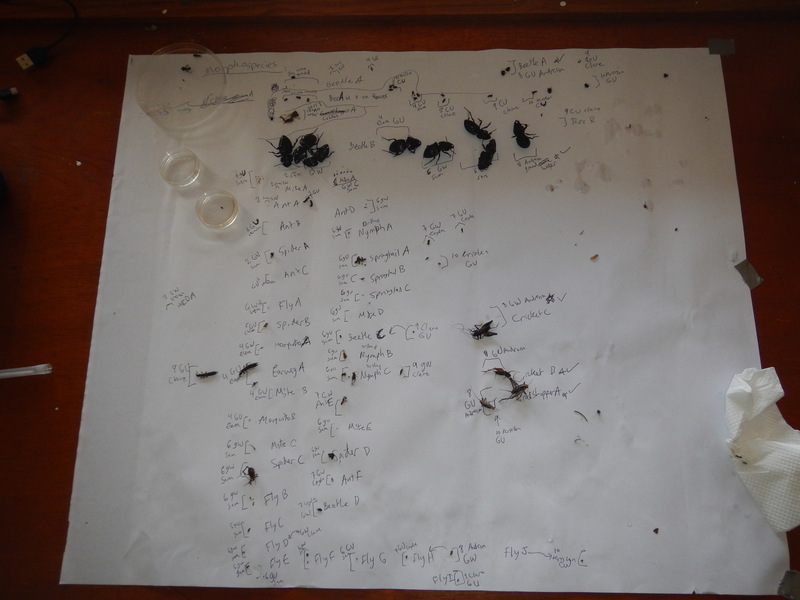 The first heavy rain ignited the nuptial flight for some termite and ant species! I know that rain affecting the rainforest seems obvious, but this nuptial flight and predictability of some fauna presence made the whole phenomenon magical. Despite the obvious difference of salt water vs. freshwater and marine vs. terrestrial, I felt that there wasn’t much that differed. Of course, the biological diversity and make-up of the ecosystems are totally different. But if one were to equate a tree to a coral, and a reptile to a fish, one might find similar compositions and proportions of those species. 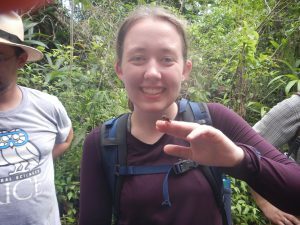 However, now that I think about it a little more, there are SO MANY undiscovered arthropods in the rainforest, and probably just as many microscopic organisms in the coral reef. If I had to guess which ecosystem has greater biological richness, my money would be on the rainforest. Scarlet macaws are endangered due to poachers who steal their babies to sell as pets. This was surprising to me because finding their nests must be pretty hard already! Frogs are really hard to find in the rainforest, especially during the dry season. Also, their sounds can deceive the human ear, and it sounds like they go in all different directions. I was actually shocked by the chorus of the rainforest at night, and I couldn’t really distinguish which animals were making what sounds. 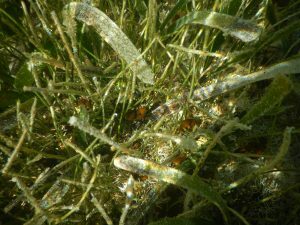 Corals can form viable hybrids that could help increase genetic diversity and resilience of global warming effects in the ocean. This is just incredibly crucial to the future of coral reefs. 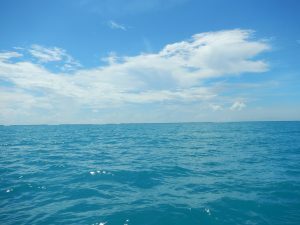 If I really had to pick a favorite part, I would say that snorkeling in the forereef and in the backreef, with such still water, was truly a once-in-a-lifetime opportunity. There was just such a range of fish—in age, size, color, and species. 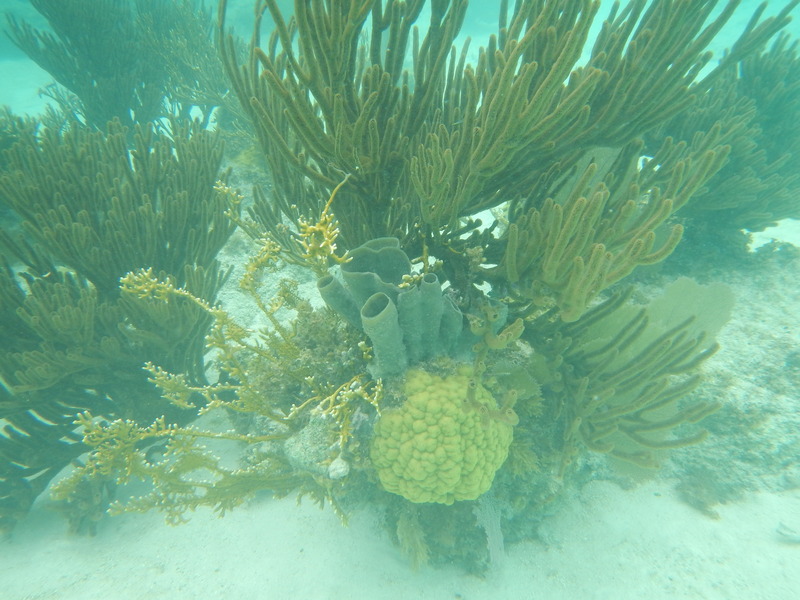 And the coral/sponges were also spectacular. And the water was so blue. And the list could go on. 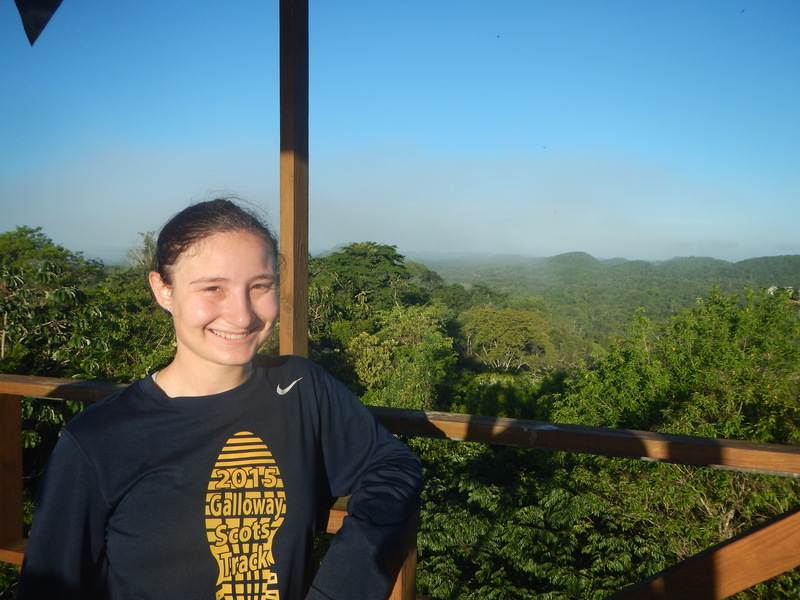 My “technically” least favorite part was the humidity in the rainforest. So dense and thick, I almost found it harder to breathe. Now, this also could have to do with my being out of shape from the semester, but either way I was surprised. And truly, if that is the worst thing I can say about this trip, then amen—this was truly an incredible trip. 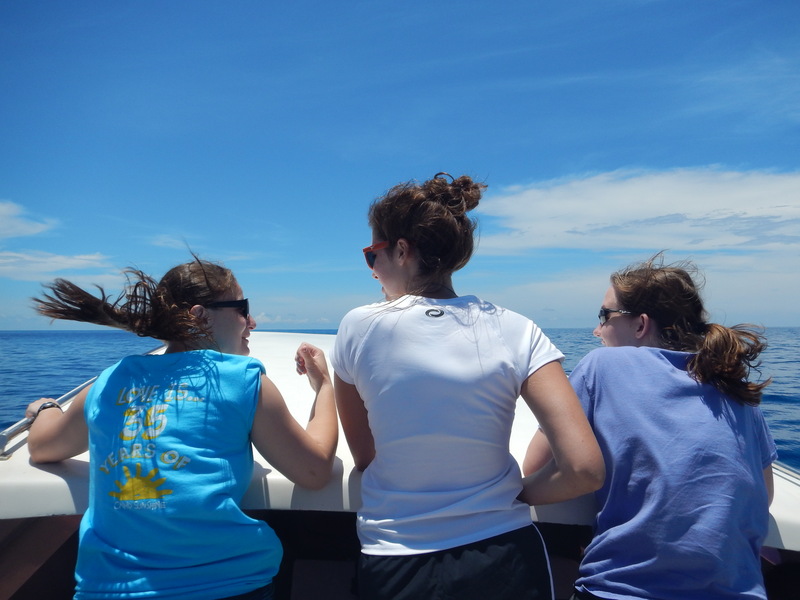 I am so thankful to have had the opportunity to go to Belize. Yesterday was mixed with bittersweet emotions, memories, and travel. I really didn’t want to leave Glover’s Reef or Belize. Going back to the real world will for sure be a transition. I woke up to see the sunrise, and it was actually gorgeous. The pictures don’t do it justice. I just soaked it all in. After packing, we had breakfast and said goodbye to the Glover’s Reef staff, as well as the Coast Guard and Fisheries guys too. 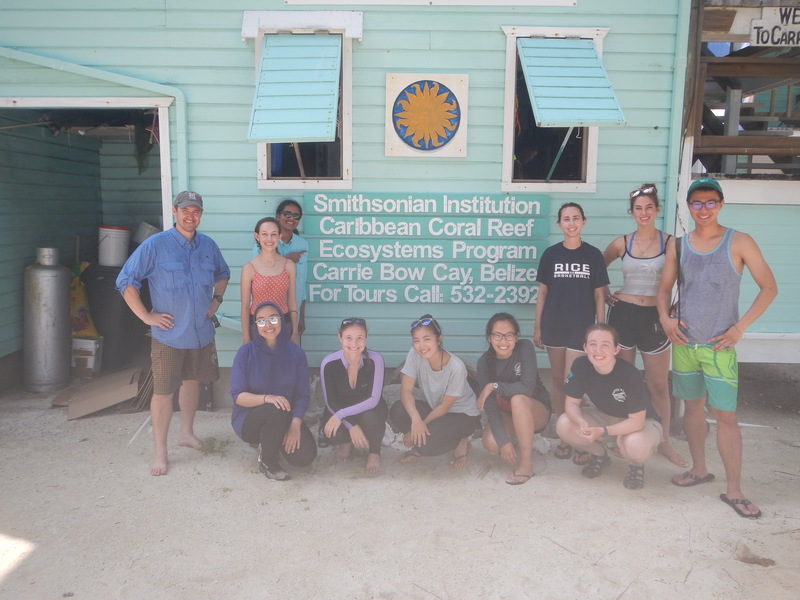 As we made the crossing back to the mainland, we stopped by Carrie Bow Cay, the Smithsonian Marine Biology research station. We met with the station manager and one of the scientists doing research there right now! She was studying the resistance of an acropara hybrid (stag and elk horn mixed tougher) to heat stress. She could really help figure out how to save some coral reefs when it comes to ocean warming. Afterwards, we stopped at Twin Cay, a mangrove island, to explore what life is like under its roots. There were tons of fire sponges and orange encrusting sponges. 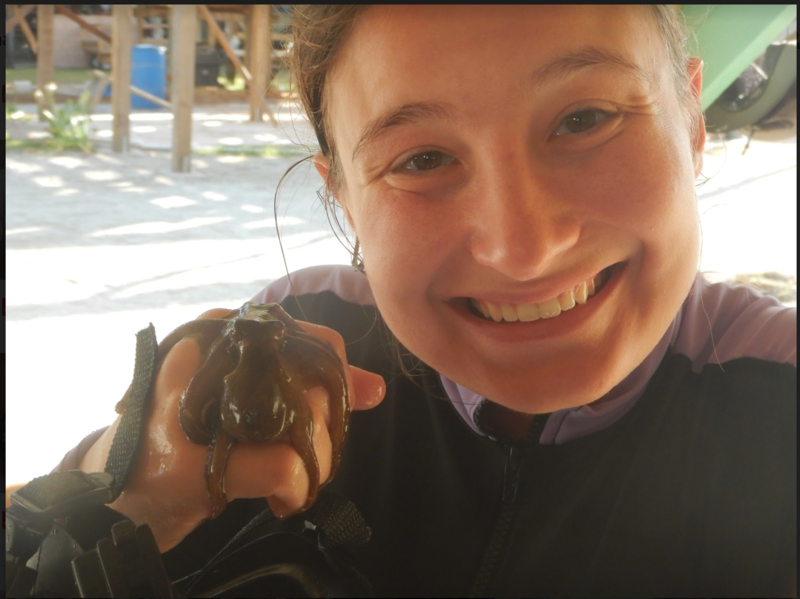 I had no idea that mangroves could host these organisms because I didn’t come across any sponge references in mangroves in my research before class. I was fascinated. There were also tons of upside down jellyfish, and I spotted my fair share of baby barracuda. Before I knew it, we were back on the boat headed to lunch at the marina restaurant. I ordered creamy shrimp pasta and a fruit punch drink—both delicious! As our goodbye salute to being TFBs, our van to the airport had no air conditioning, so we all sweated out the rest of the salt water from the mangroves. The flight home was captained by Claire’s dad again (it’s so fun getting a shout-out from the cockpit! ), and before we knew it, we were back in Houston. This was truly the best “study abroad” I could have asked for with my limited credits and availability. I feel so lucky to have gone on this trip. Reflection blog post coming soon. Yesterday (May 28th) was our last full day in Belize, so we had to celebrate and soak it all in. 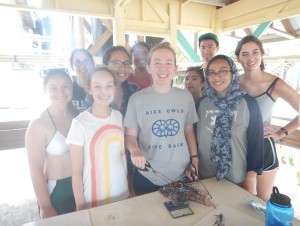 We started by dissecting then eating the lionfish we’d caught over the course of the week. The monstrous lionfish ended up being over 0.5 kg!! He (determined by looking at the gonads) had a swim bladder that took up most of the body cavity. I was particularly fascinated with the gill structure as well as the mouth parts used to capture prey. Scott then made his famous lionfish ceviche which I had never tried before. (Both the lionfish and a ceviche.) It tasted very fishy and chewy—not my favorite, but not bad either. In the afternoon, we had some free time, so of course, I went snorkeling. Veronica, Sam, Chloe, and Elena came as well. I saw lots of sponges, particularly the tube and rope sponges. I also saw my first Touch-me-not sponge, a stinging, painful one when rubbed the wrong way. 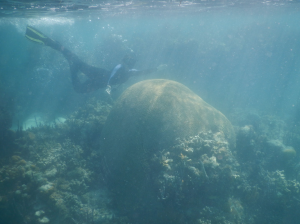 We also saw a brain coral that was three times my arm span in diameter, which is so impressive and wonderful. There were lots of lobster out of all shapes and sizes too. 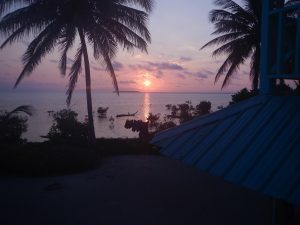 In the evening, we did group meditation on the dock, looked for tarpon in the water, and just enjoyed our last night in Belize. I now sit here watching the sunrise over the horizon, the last one we’ll see here. I am so grateful for this planet, this trip, and everything in between. There is still so much to do and see, I’m not ready to leave yet!! Day 13: It’s a Dinglehopper! Today started with a HUGE thunderstorm. The ominous clouds loomed overhead while I sat in the hammocks, then the wind picked up, fiercely blowing my hammock and rocking me. As soon as I moved inside, the storm down-poured! Since it’s not the rainy season, and we are on an island, this was not an anticipated weather pattern. When we finished the lectures, we set out to collect some data (and trash) from two different sides of the island. Marine debris is a HUGE problem, no matter how remote a place is, you can find trash in some form, such as whole pieces, parts, or microplastics. We wanted to compare the trash levels on the windward and leeward side of the island. We found that the windward size had larger pieces that were less transportable (like floating/moving with the current), and the leeward side has more general pieces in smaller size. I did find a fork, and it made me think of Scuttle. I also found an entire bottle of Sprite unopened in the mangrove bed. Pictures weren’t taken because my hands were either busy holding trash or swatting as mosquitos. In the afternoon, we headed out to do adventure snorkeling, a chance to explore the reefs around us and see our taxon on a different side of the atoll. We visited a patch reef that was 10-25 ft deep, and there we found the biggest nurse shark I (and the MPOs) had ever seen!! We decided it was a she (no idea why), and she had a bottle with a fishing line stuck to her fin. We tried to figure out ways we could free her, but there wasn’t any way we could do it without hurting both her and us since we didn’t have scissors. The best experience of Glover’s Reef was getting to snorkel over the reef crest. Normally no one can swim the reef crest because the waves are big, powerful, and overwhelming. But today, the ocean was so calm we could explore. 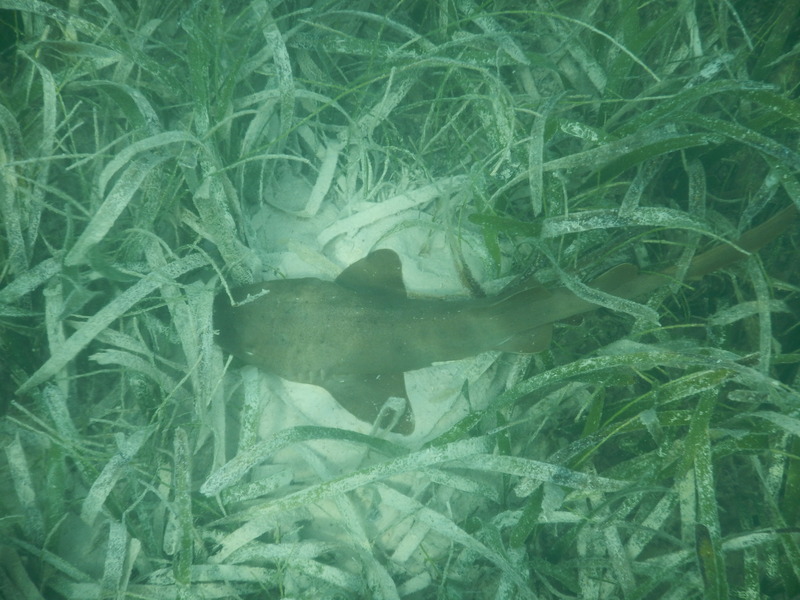 Seriously, this is almost unheard of in a marine ecosystem. 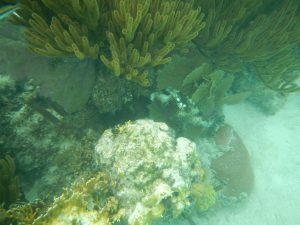 The coral were gorgeous, fish were huge, there were fry schools, a blacktip reef shark, filefish, trumpetfish, triggerfish, cowfish, and so much more. I noted that there were many encrusting sponges and a few vase sponges, and my new favorite sponge, the stove pipe sponge. We did a lot of exploring and learning, and even some of the drop-off (figured I throw in some Finding Nemo reference even though it’s the wrong area of the globe). We started the morning of May 25thwith a presentation from the Belize Fisheries and Coast Guard divisions and how they enforce their laws. 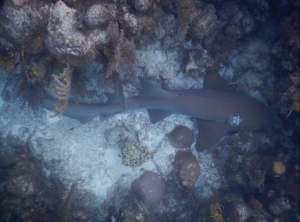 It was awesome to get some context on just how important of an area Glover’s Reef is. Then we hopped on the boat for a morning of exploring the forereef—we stopped at two different places: an area behind Southwest Cay and an area behind our island that is the drop off. These snorkels were really gorgeous; the diversity of coral, fish, and other wildlife such as rays, sponges, and soft corals. There seemed to be a lot of Ctenophores, which are commonly known as comb jellies even though they aren’t jellyfish. I had hoped to see a sea turtle since they love snacking on those, but alas, none were found. The sponges in the spurs and grooves leaving to the drop-off weren’t very diverse in species but had incredible ranges of color. 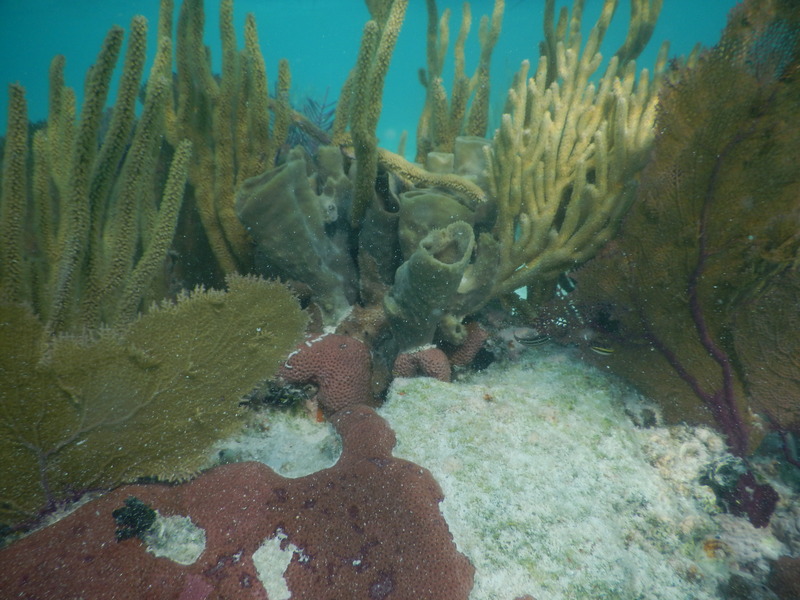 The branching tube sponges were gray to green to blue, and the rope sponges varied from brown to red to tan. There were a few vase sponges that had hints of pink and light blue and green in the same one! 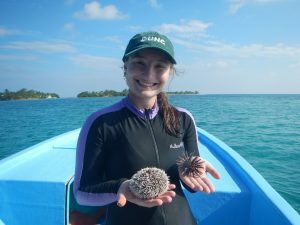 In the afternoon, we collected sea urchins to measure their size and species richness to test the health of the reef at one reef patch inside the MPA and the other outside of it. I did manage to nab a black sea urchin with some tongs, after many tries. We haven’t yet analyzed our data, so stay tuned! My lip is sunburned, but my soul is happy. I love being out on the water and exploring, and even better to be doing science at the same time! Day 9: See the Line Where the Sky Meets the Sea? DISCLAIMER: There was a storm last night that knocked out the wifi. But it has returned! So here is the post for May 23rd. I was less than happy when I found out that I forgot to put sunscreen on my right arm… (Literally remembered everywhere else including the tops of my feet!) I will now be toasty red more so on one side. But oh well, I’ll hopefully get a nice tan! 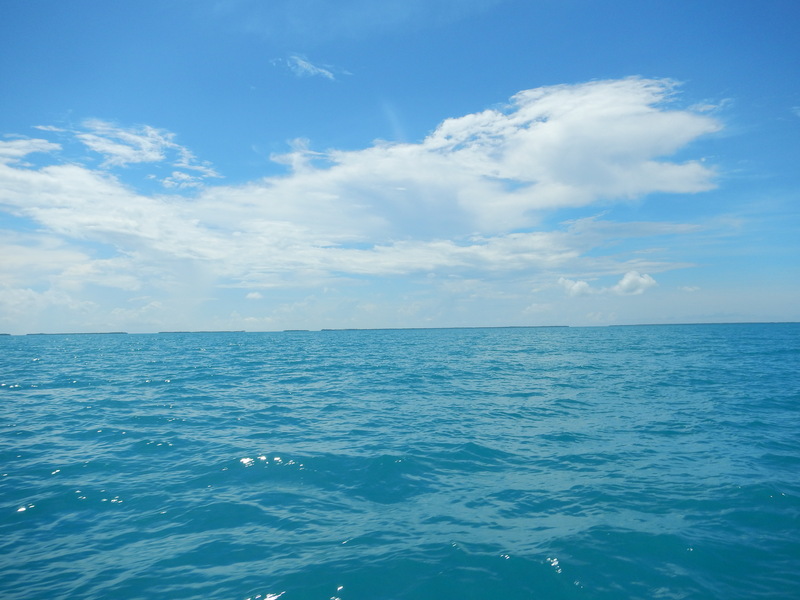 When we arrived at Middle Cay and had eaten lunch, we got in the water for our introductory snorkel. It was fun to rediscover snorkeling alongside those who had never done it before. I also now officially change my taxon away from amphibians and on to sponges. 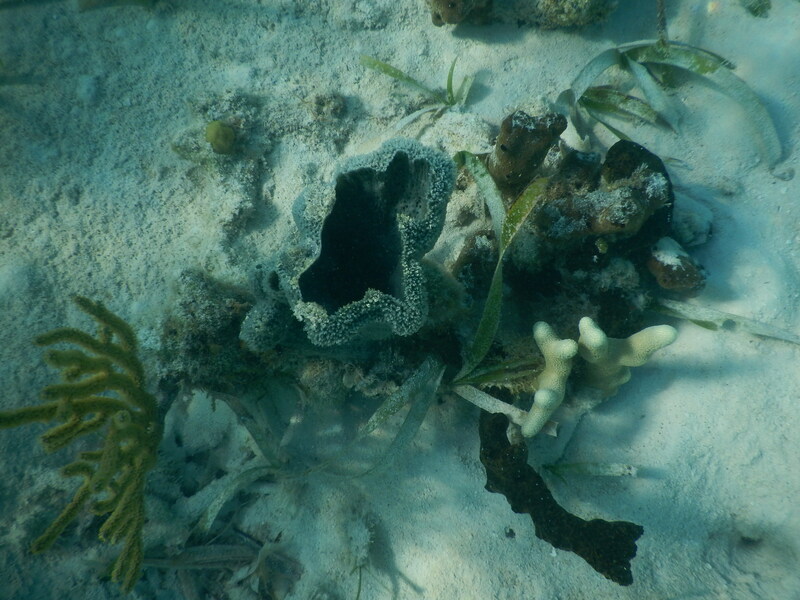 I spotted lots of encrusting sponges, and my favorite tube sponge. The water was decently murky from the seagrass beds with sand and people’s flippers kicking it up. We also found a yellow stingray, baby nurse shark, barracuda, trumpet fish, parrotfish, and lots of brown algae. 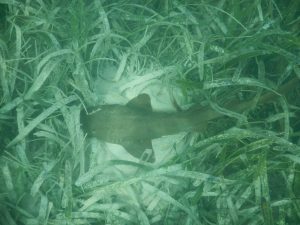 Then I enjoyed our free time by journaling and talking to the other workers on the island on the pier—we saw a lemon shark swim by, as well as a school of bonefish. The pelican dive bombing the sardine patches definitely caught me off guard because I was looking at my journal. It was a beautiful end to an incredible Reef Day 1. Yesterday (May 22nd) was a super start to our mini weekend. We spent it in transition from Turf to Surf, and did a few fun things along the way. 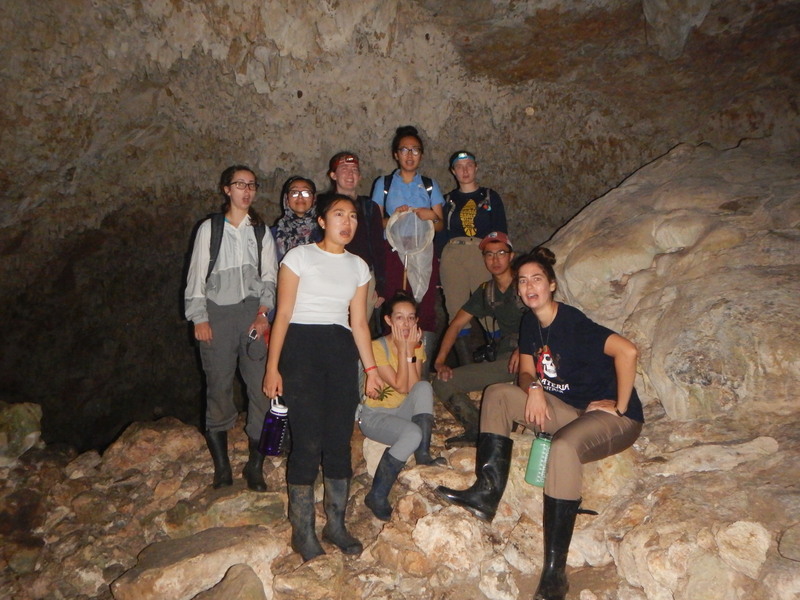 No amphibians (or sponges) were spotted today because we were mostly in the cave or in the sun–two environments where neither of those are found. After a bittersweet goodbye to Las Cuevas and the staff, we hopped on a plane and headed east for 3 hours. 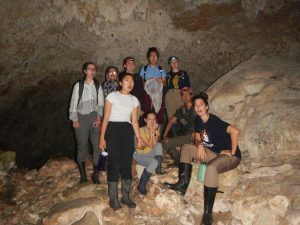 Then we reached the ATM Cave–its English translation is “The Cave of the Stone Tomb.” There was a 45 minute swim/wade in to the cave then we climbed barefoot. The most interesting thing we saw was a nearly intact skeleton of a 16-18 year old–the namesake for the cave. Likely, this person was a human sacrifice for when the Maya civilization was in trouble, and they were desperate to please their gods. Then we made our way to the Tropical Education Center, our home for the night. They put us in the adorable forest cabanas and fed us a lovely meal. 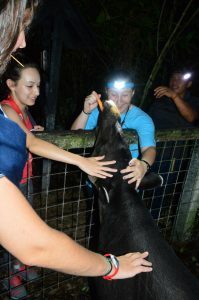 That night, we got the opportunity to get a night tour of The Belize Zoo! Of course, I LOVED it. There were so many species and wonderful nocturnal life. The highlight for me: Meeting Indy the Tapir. We fed him carrots and watched his little nose trunk. He was SO CUTE!!!! What a great end to our night. This post was meant to be for yesterday (May 21st), but you are about to find out why I haven’t written it until now. We started the morning at 4:45 am. We wanted to wake up and reach the Bird Tower around early morning light, but the hike up there is extra steep. So we set our around 5:15 am and headed to the trails. Probably one of the steepest (and slipperiest) hikes I’ve ever been on. I had hoped to see some amphibians since it had rained last night, but unfortunately, none were out. The rest of the day wasn’t successful either, so today’s blog post will just report on my general day. Then we came back down for breakfast, then went on a 5 mile hike to collect our camera traps. We didn’t view the photos right away because we wanted to wait for nightfall to get the best contrast with the screen. Then we went to a 15-20 year old nest slightly off trail in the woods. Scott started digging and we all took turns trying to shovel, but the ants just couldn’t seemed bothered. Turns out, we had dug up a dead fungi garden chamber and dumping ground. It was super weird; this was only the second time that Scott dug that up in his entire 17 years of ant experience! That night, we checked out our camera traps. It was so AMAZING. On the first card that we looked at, there was a tapir taken one night and a jaguar the next night as the immediate next picture!! The shouts and hollers were amazing. Unfortunately, I don’t have access to those pictures right now, otherwise I would include them. For the rest of the pictures, we snapped a coatimundi, a 9-banded armadillo, 2 puma, several peccaries, male curassow, female curassow, and a coral snake. Apparently, this was the best luck in all of TFBs history. We went to bed pretty late for a 4 am wake up call to leave Las Cuevas… Stay tuned! This post was supposed to be written last night (May 20th), but then I took a Benadryl (#thankschiggers) and fell asleep while typing. Shoutout to Mom and Jems for a happy birthday! Yesterday, we spent half of the morning collecting our urine and water samples. Veronica netted another Mexican Tree Frog, but this one had varying shades of brown and green to help it camouflage in the leaf litter. When we returnred, we started analyzing our catches. (Check out Day 4 for the background on this project.) So basically, for the next 5 hours, I looked at insects of all different kinds. Standing over a bunch of springtails, flies, etc and helping our experts (other students who looked at those insects closely) was frustrating but rewarding. Also, everything smelled like urine. While we were analyzing data, a huge thunderstorm cracked through the sky and we had the chance to get rained on in the rainforest! Scott was especially excited because the first big rain of the season triggers social insects’ nuptial (mating) flights. A few hours later, there were termites EVERYWHERE, and their wings shed very easily. 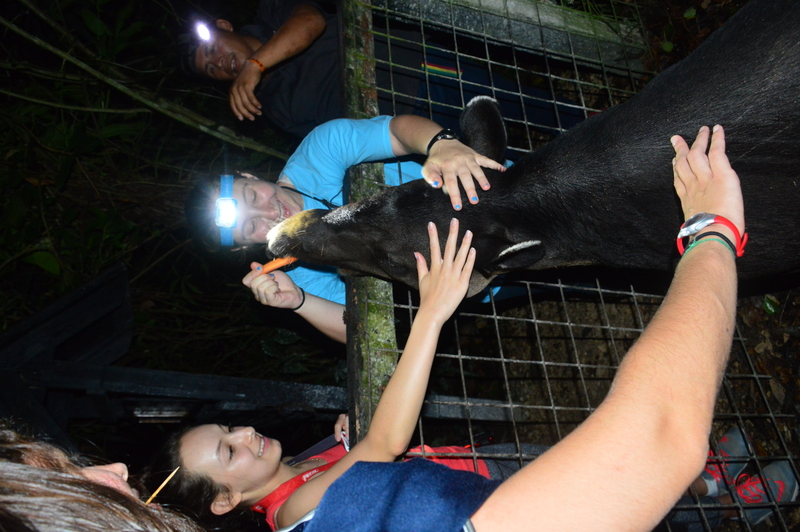 After the thunderstorm, a group of 25 from Southern Mississippi University arrived. The instructor for their course was intrigued with our insect project, and so he asked if we could present to his group on our urine insects. After much convincing, the group unanimously decided to go for it—and along the way we made all the “pee” puns. We were sad that our personal research station was no longer just ours, but we also had a great icebreaker to meet some new people.